We’re running a promotion for our second anthology, Smoke and Steam. Beginning at midnight, Pacific Daylight Time, you can get a copy of the ebook from Amazon for free. The promotion runs through March 19 and ends at 11:59 PDT. Smoke and Steam contains four Steampunk novellas from Corrugated Sky‘s authors. For those of you unfamiliar with the term, the Steampunk genre is a type of science fiction/fantasy/alternative history based on Victorian-era technology. Sometimes it includes magic, or werewolves, or man/machine hybrids. And airships and trains are pretty much de rigueur. “Hekatite,” by Karen Garvin; “Heart of the Matter,” by Michelle Schad; and “Freedom for a Foster,” by Cathryn Leigh. Head on over to Amazon during the promotion and download a free copy of the ebook. While you’re there, why not pick up a paperback, too? After all, it’s how the Victorians would have read their books! This crocheted flower is made from ribbon yarn. I’ve just finished editing a nonfiction article I’ve been working on for awhile, but instead of feeling like I’ve accomplished something, I just feel overwhelmed. Or underwhelmed, I don’t know which. I’m blaming the weather but I think I’m burning out. It doesn’t help that I keep getting massive doctor and dental bills to deal with. It hasn’t escaped my attention that this year has a 13 in it. Triskadekaphobia,* anyone? So anyway, I have a whole laundry list of things that I still need to write. I shouldn’t gripe; after all, I do bring this on myself. It’s just that I seem to be pretty much out of ideas right now. Last night I gave up on revising the article and put it off until this morning. 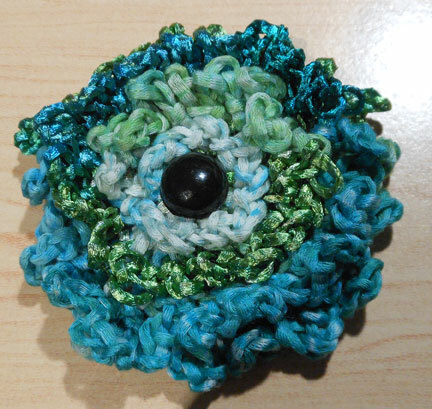 Instead, I made a crocheted flower just so I could have a small project that I could finish and feel better. I think it helped me relax a little bit, too. It’s less than three weeks away from the Steampunk World’s Fair, and I need to work on my airship presentation, a biography for a class, and a book proposal. But the toughest assignment is to revamp my resume and create a curriculum vitae. It’s not just the word count that makes a writing project tough! *Fear of the number thirteen. So far this year I haven’t been back on course with the Thursday writing prompts, or much else. A hard-drive crash on my old computer, doctor’s appointments, and various other issues have made this month pretty much of a logistical nightmare. I hope this isn’t the way the rest of the year is going to be. And I’ve already realized that my intention of taking a European vacation this year is going to have to be put off until next year. There’s just too much to get done this year, and not enough money to spread around. But I think I may be close to getting my groove back for writing. I’ve been working on some encyclopedia articles and I have several in various stages of completion. My goal is to get five of them done by the end of this coming week. Two are written and need to bed edited and reviewed, two need to be finished and are about three-quarters done, and one is hostage on my old computer’s secondary drive and on my backup hard drive. I just haven’t opened the computer case to take out the old hard drive and install it in the new one yet. In any case, I’m feeling pretty good about getting these done, which will leave me with seven articles due the end of April. And next week, I start working on my research paper. I’m already doing the reading, but my way of taking notes is a bit, um. Well, I don’t take notes until I’m done with my first read because I’m never sure what I’m going to find important to my paper. Instead, I decorate the books with flags so that by the time I start writing I have a stack of books that look like porcupines. And some hastily scribbled notes that are sometimes just short phrases and links to page numbers. It works for me, even if it isn’t the most organized way of doing research. Well, now I’m off to do some reading about airships. And keep an eye on the airship postcards I’ve bid for on eBay. I’ve started a collection and I have three cards with two on order. It’s not much, but so far it’s an informal collection and I pick up a card or two when I have some spare cash. I’m trying to decide whether to make an album or mat and frame some of them to go with my Graf Zeppelin model, which I haven’t assembled yet. The Smithsonian Institution is opening an exhibit at the National Postal Museum in Washington, D.C., on March 22, 2012, to honor the anniversaries of the Hindenburg and the Titanic. The Fire and Ice exhibit runs through January 6, 2014. I have plenty of time to visit before the exhibit closes. Airships have been an interest of mine for quite awhile, and three years ago I presented a paper on World War I German airships at the Mid-Atlantic Regional meeting of Phi Alpha Theta. So, why are an airship and a steamer being honored at the postal museum? Simple: because both the Hindenburg and the Titanic served as mail carriers. According to the Smithsonian’s website, the Hindenburg was the largest flying post office ever built. The airship carried more than 17,000 pieces of transatlantic mail and a few hundred pieces managed to survive the fire when the ship exploded, but mail aboard the Titanic went down with the ship. If you want to know more about the Hindenburg or Titanic, the Smithsonian’s website has a bibliography for each one that offers websites, films, and publications about these two giants. Like this blog? Support Me on Ko-fi. Images on this website are copyright Karen S. Garvin. Please contact me if you are interested in purchasing high-resolution versions of my work.